Honesty is important, so here goes. 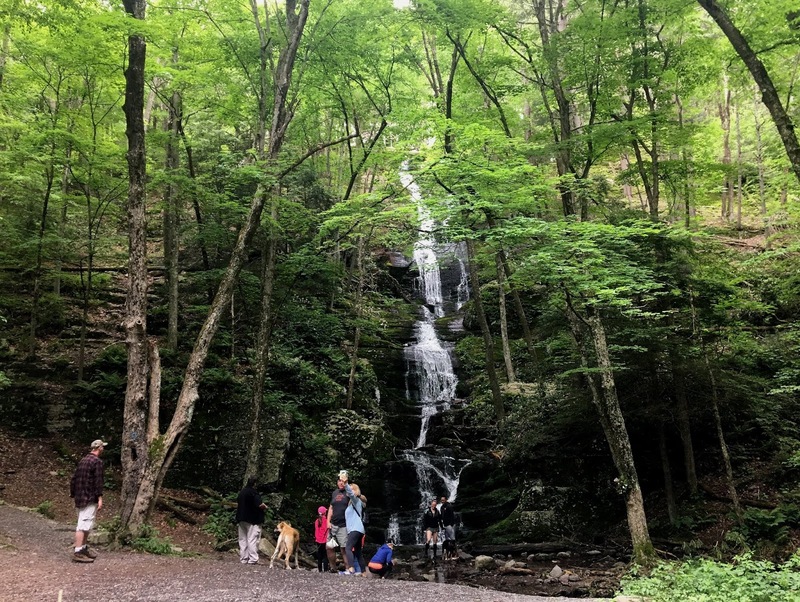 I considered taking New Jersey's tallest waterfall off of my list of hikes when I discovered the most obvious way to get there is a 50-foot walk from a large parking lot. Buttermilk Falls from the bottom. Glad we decided to make a trip there after all! 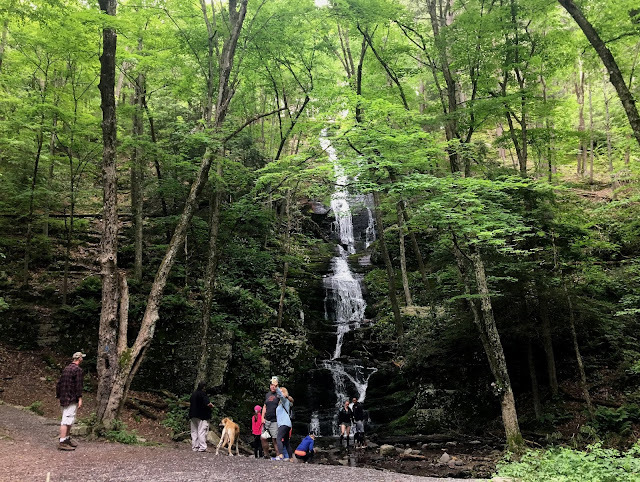 Buttermilk Falls looked fantastic, but driving over two hours to the Delaware Water Gap National Recreation Area without a full day's hike on the menu didn't sound appealing. Fortunately, the Water Gap is home to miles and miles of trails. I grabbed my Kittatinny Trails map set to see if I could plan out a challenging day hike that included the Falls. Turns out, there are a ton of options! 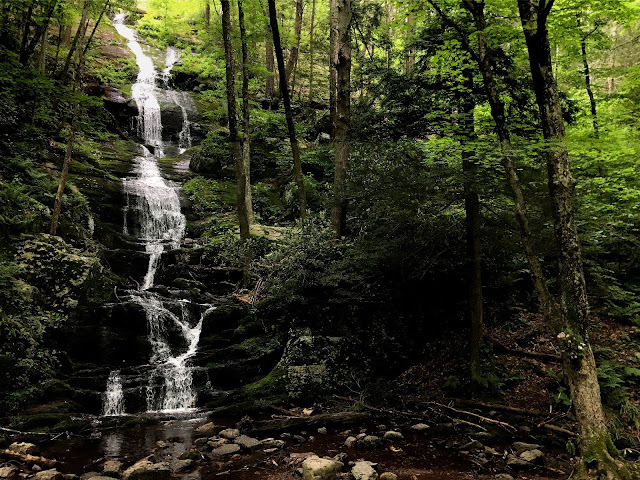 Depending on your appetite for distance hiking and elevation gain/loss, there are plenty of ways to include Buttermilk Falls on a longer day hike. We settled on starting about three miles from the Falls at Crater Lake, making the Falls the midpoint of our hike. This also gave us the option to add more mileage on the (steep uphill) return trip if we felt up for it by including trails around Blue Mountain Lakes. The trails we took are highlighted in orange. Definitely grab a copy of this map set before you go! We drove from Philadelphia to the Crater Lake parking lot here. I added the parking lot as a saved place in Google Maps before we left, which made getting directions a piece of cake. Sprint cell service was spotty, but for the most part, I had it the entire way up. We arrived at the parking lot at 10:30am and after paying a visit to the well-kept bathroom, we headed out on an orange blazed route toward the Appalachian Trail (AT). (Facing the lake from the parking lot, the trail starts to the right; look for an old metal gate at the edge of the parking lot blocking what looks like an old road.) The wide orange blazed trail allowed us to walk side by side up and around the lake, and we quickly found ourselves at an intersection with the AT. Crater Lake from just beyond the parking lot. The start of the hike is to the right. We turned right, walking along the AT. The trail narrowed in places, and was mostly shaded. We kept an eye out to our left for an intersection with a blue blazed trail leading to the falls, but thanks to obvious signage, we didn't have to look hard. 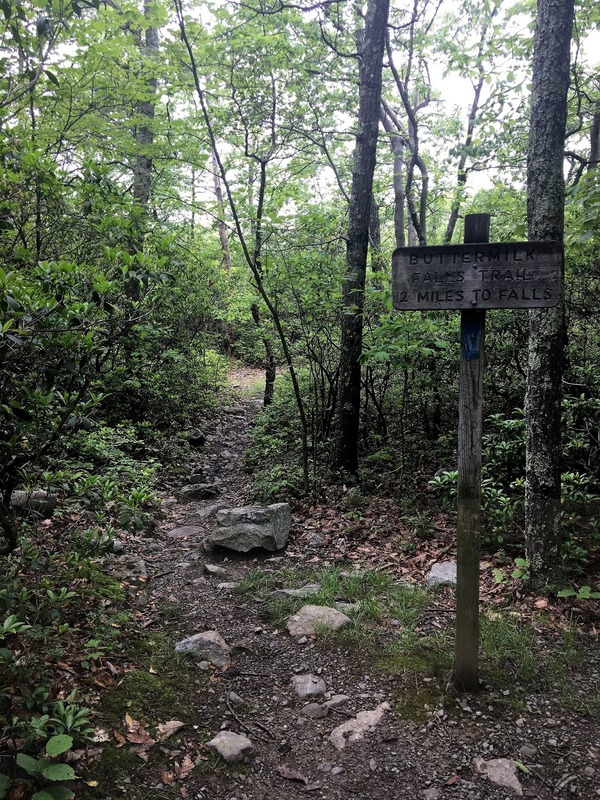 After turning left on to the blue blazed Buttermilk Falls Trail, the terrain got significantly steeper, rockier, and more slippery. 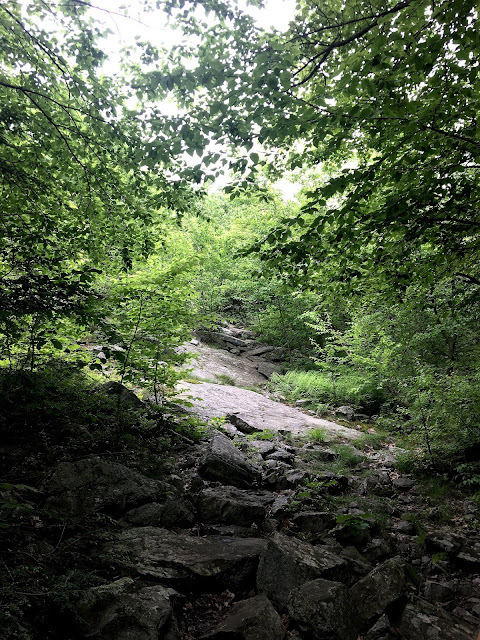 We'd postponed our hike a day due to thunderstorms and I was glad we had; portions of the trail covered steep, muddy slopes and featureless rock. Treading carefully, we picked our way down toward the intersection with Woods Road. I couldn't help but think how brutal the route back up was going to be! The obvious intersection with the Buttermilk Falls Trail. We crossed Woods Road, an obvious old road running perpendicular to the Buttermilk Falls Trail, and continued to follow blue blazes. Eventually, we started to hear the sound of running water. 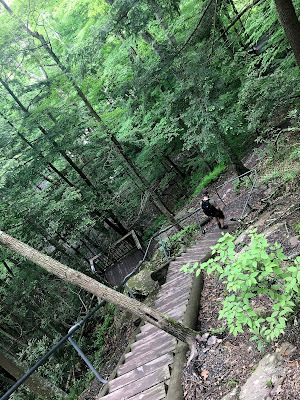 After descending another steep, slippery, muddy, rocky slope, we found ourselves approaching a dozen children and adults standing on a bridge and wooden viewing platform built into the side of the hill. I enjoyed popping out of the woods and seeing the people, feeling both accomplished that we'd walked our way there and glad there was a well-established, well-maintained option for folks not interested in completing or able to complete the hike. 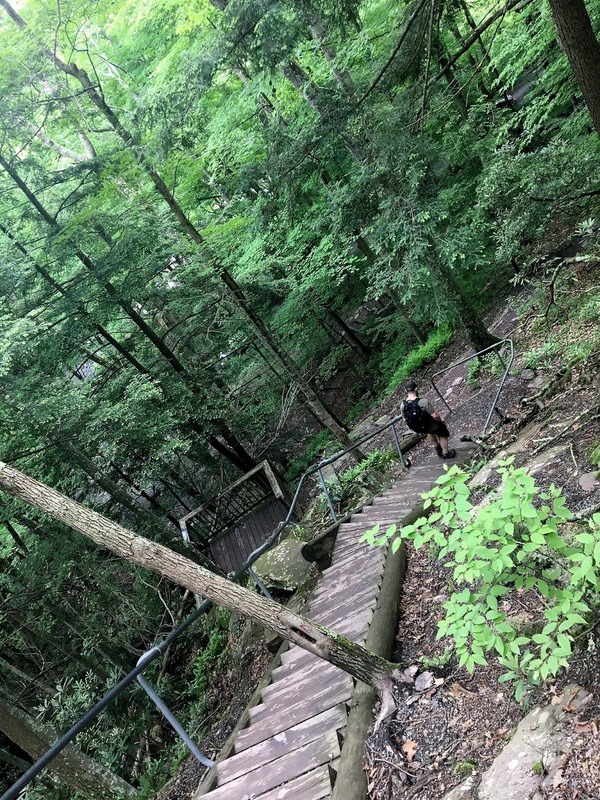 The viewing platform gave us a small glimpse of what was 90 feet below, and we made our way down wide wooden stairs to the base of the falls. Some of the folks we met at the base of the Falls. Also cool to see how big the Falls really with humans for scale. After chatting with other visitors and snapping a few photos, we started the steep ascent back up the stairs to the top of the Falls, and continued the climb back to Crater Lake. Following the blue blazed Buttermilk Falls Trail back the way we came, we ascended 800-900 vertical feet before coming to the Woods Road intersection. 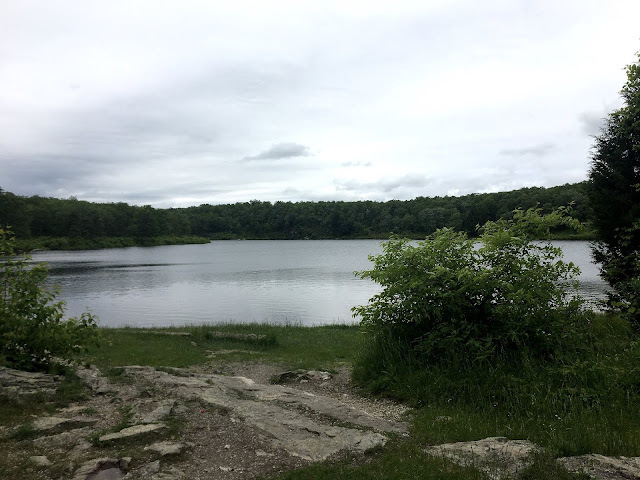 This time, we turned right to follow the road toward Hemlock Pond for a change of scenery, and I was glad for a reprieve from the steep terrain. We walked side by side, passing a marshy swamp on our left and crossing a creek before arriving at the pond. Hikers can choose to go around either side of the pond, but we took our first left back on to the orange blazed trail toward Crater Lake. Some of the blue blazed Buttermilk Falls Trail - steep right? After more climbing and following the orange blazes along a narrower trail, we came back to the intersection with the AT. The map made it look as if we could just go straight across the AT to continue along the trail to Crater Lake, but we had to turn right and walk down the AT a hundred feet or so to find the continuation of the trail. At that point, we were following the same orange blazes we'd followed to get to the AT, and Crater Lake came into view. Shortly, we were back in the parking lot. The hike took us about four hours in total, including stops for snacks (thanks Greenbelly Meals!). Get this map set and bring map #121 with you. Though I did find a few trail descriptions in advance, none had me convinced I'd pick the right set of trails in the region without a map. "Right" meaning right for us, given the time frame and the distance we were interested in. Having the map handy gave us the ability to navigate more easily, understand what the terrain was going to look like, and adjust our plans, which all came in handy. The stairs down from the viewing platform to the Falls. If you start at Crater Lake like we did, be prepared to drive on some bumpy roads. Skyline Drive, the road leading up to the parking lot we parked in, was full of massive potholes. The speed limit is 15mph, and I definitely didn't exceed that in my Toyota Corolla. You don't need a high clearance vehicle, but it wouldn't hurt. There's a big, beautiful two-person pit toilet style bathroom at the Crater Lake parking lot, but no facilities at Buttermilk Falls. This seemed odd to me, as the Falls parking lot clearly sees more use. But if you do need to do your business at the base of the falls, pack out your toilet paper and feminine products. I saw a pile of both behind a tree next to the parking lot. Ew. Wear sturdy shoes and be prepared for some steep, slippery terrain. We had featureless sloping rock, muddy slopes, steep grave slopes, and everything in between to contend with. 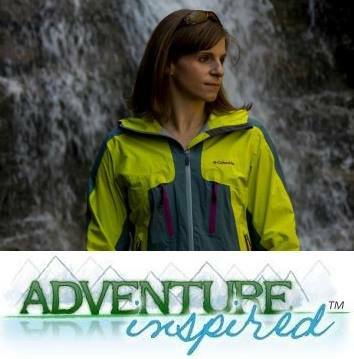 You're not going to want to do this route in anything except shoes specifically designed for hiking. Overall, I'd love to go back and incorporate Blue Mountain Lakes trails along with other trails in the area into a different route. There's so much to do in the Water Gap outside of Mount Tammany and Mount Minsi! Who's been there? What's your favorite hike in the area.